September 23, 2018 – Rev. Canon Dr. William J. Danaher Jr.
Rev. Canon Dr. William J.. Danaher Jr.
Next week, we will celebrate the 90th anniversary of the founding of Christ Church Cranbrook, and the bishop will come and visit and he will baptize and he will confirm and he will preach and he will celebrate. And it will be a wonderful moment, an incredible moment of thanksgiving. And because the bishop is going to do all those things, I don’t get a chance to talk about how important this place is to me. So this sermon in some ways is going to be my 90 anniversary sermon, because I think that’s only fair, and I do apologize to you if this seems to be premature. But when I think about this incredible church, I think about the history that I tell about its founding 90 years ago, in which there was this incredible expression of generosity that meant that this church would be built as a whole over three years from 1926 to a bit short of 1929. And it was then consecrated for the glory of God. And it has shined as a beacon for years in this area. But when I think about this church, I also think not so much about the physical structure, as impressive as it is, I think about the people that I have had the privilege of knowing who came after the founders, the people who kept the momentum going, who brought their own spiritual momentum to this incredible church and kept it on its path to transformation. And over the past week, I’ve been thinking about one person in particular, because I feel like her life has a kind of shining light on the gospel, and it’s a person who I buried in 2015 named [Toshiko Shimura]. She was a faithful member of St. Johns in Detroit before becoming a member of Christ Church Cranbrook and she died in 2015. And Toshi was an incredible gift to this community and to this wider area. She had been born on the West Coast and during World War II, she and her family, because she was Japanese, was moved into an internment camp in Topaz, Utah. And Toshi stayed there for about two-and-a-half years and then, while she’s in an internment camp, she gets herself admitted into Michigan State University to study biology. And so, without any money because the family couldn’t earn their living while they were in the internment camp, she gets on a train to Lansing, Michigan, and goes as a young man from that internment camp to Lansing to study microbiology. That was her field. And she had no coat and she had little money, and so she wasn’t eating on the trip and she got tired, and so she fell asleep on the train and when she woke up, she found that there had been a GI there and he had thrown his coat over her. This was World War II, this GI saw this young Japanese woman asleep on the train, and he put his coat over her and then he bought her a meal, and then they went their separate ways. She never forgot that simple gesture of kindness and her own work was its own kind of momentum and she kept going. And she graduated from Michigan State University in 1949, and then she did what many people did in those days, she married and she settled in this area. She built a life with her husband, and she worked to create the kind of context for reconciliation between Japan and the United States after the war. She practiced Ikebana, which is a Japanese art form. It’s one of the great art forms of refinement in Japan. It’s the art of flower arrangement, but unlike our beautiful flowers, what Ikebana does is it actually tries to work with the environment around you. You take flowers that are in season, and when you arrange Ikebana, you make sure that there are still leaves evident and there’s water evident because Ikebana wants to create this kind of reconciliation between the individual and their environment. Between the world they’re living in and the person they are. It originated as a kind of beautifying of the Shinto altars and it then moved into homes as homes became sacred places, and then she practiced it here. When she died, the governor, the Consul General of Japan came and gave one of her reflections at her service, because of all the work she had done to reconcile, Japan, the United States and to support the Japanese community here. Toshi Shimura. She was a member of Christ Church, Cranbrook, she found a home here. And it’s that kind of story that gives me life and energy, that gives me a sense of who I am and why I’m here, about how I find Jesus here. Toshi Shimura. Remarkable woman. Such a gift. And I was thinking about her because I was beginning to think that what Toshi was about was these gestures. That moment in which she decided to take the train all the way to Lansing, Michigan, that was a kind of gesture; a kind of moving into the world around her; a kind of attempt to kind of present herself in such a way. And what the GI did when he reached out and took care of her and protected her that was a kind of gesture. Gestures are often denigrated. They’re seen as kind of unthinking things we do. Like if you brush your hair back or if you shake hands. But gestures are actually incredibly important. When we’re in unfamiliar circumstances, there are moments in which we engage in a gesture to kind of create connection and to present ourselves. Gestures build communities where there isn’t a community before. Gestures are moments of vulnerability. When we lay ourselves open to the other in the hope that people return the nice kind thing we do. And when we think about the history of Christ Church Cranbrook, it’s not so much the history of an institution, it’s the history of gestures. When the Booths gave the money to build this church where there was no church before, this was of a massive material gesture. The hope that somehow in giving so much of their fortune to the glory of God through this church that somehow a church we come. A little bit like that game as movie, Field of Dreams. If you build it, they will come. They engaged in this incredible gesture, and lo and behold, people came and brought their own gestures of generosity here. Gestures are incredibly important. They help us present ourselves in a new way. They speak about a deeper commitment and tie one to another. Now, all of this, I want to suggest, is a way for us to see what’s going on in our reading today from the Gospel of Mark, because this is a key passage of scripture, and you need to walk away today understanding it better than you perhaps do now. Because there are two ways in which this passage has been interpreted that I think are just kind of misleading. The first is to say that when the disciples get into the argument along the way and they’re silent before Jesus, Jesus says that He’s going to die and be raised and then they have this argument out of His ear, and then He asks them why they were arguing and they say they were arguing over who was the greatest. And then he takes a child and puts it in their midst. When the disciples are having that argument, we like to think that they are simply being kind of arrogant or selfish or self-seeking, that they are trying to somehow engage in kind of a weird experience of office politics, but in fact the disciples are doing what they had been taught to do in their context. They had just been told by Jesus, that He is going to die and so they are trying to figure out who will succeed Jesus. And what you did in that context is you actually tried to figure out who’s going to be the best person to lead this movement forward. The best government, Plato wrote, was aristocracy, was the rule by the best, and so they were simply doing what they had been taught to do when there was going to be a transition. And Jesus says, no, the Kingdom of God and my mission is not going to be built by calculation, it’s not going to be built by thinking like an institution and self-perpetuating yourselves. Jesus instead puts a child in their midst. What did He mean by that? Here’s the second thing you need to know. Children in the ancient world were not particularly special, they were actually seen to be a little bit miserable, and a little bit conniving, and the best thing you could do with a child is put them to work, and if they were wealthy to give an education. Children were not particularly pure or innocent or lovely. They were small, they couldn’t do philosophy. There was no reason why you wanted a child around you, if you could help it. It’s not until the 19th century that we start to elevate children. And there is a term, believe it or not, that comes out in the 18th century when we talk about children as little redeemers. And these children are now seen as little mouths of God, but in fact, in those days, they weren’t. So when Jesus puts a child in their midst, He’s not trying to appeal to their sentiments. He’s not trying to get them to become childlike. He’s not trying to get them to become innocent. He’s trying to get His disciples to see something powerful about the gospel. You see, what’s operating in this gospel today, is a kind of theology of gesture. Jesus has just told the disciples that He was going to die and be raised. He was going to be betrayed, die, and be raised. Jesus just told His disciples that He is the gesture of God, He is God’s gesture of love to this world, God’s moment in which God gives God’s self in all of God’s vulnerability, in all of the hope that we would return that gesture with love. And what they needed to focus on was the way that child represents a kind of gesture of love to God back, that in receiving that child and reaching out, for no reason they were going with the grain of God’s love for us. Because to receive a child, as Jesus was asking the disciples to receive a child, is to ask them to kind of move into a world of gesture on their own. The art I have for you today is one of the few pieces in classical art that I think gets close to what it means to have Jesus see children as the gesture of God. You have this moment in which this is done by Emil Nolde. He is a German, he was a follower of Vincent Van Gogh. We don’t know much of him because he wasn’t as good as Van Gogh. He worked like Van Gogh though with color and with movement. He wanted to capture gestures a little bit like Van Gogh captured the gesture of the night sky above him, and so he has Jesus not from the front. Usually when you see Jesus in the typical kind of cannon of visual tradition, He’s seen seated and the children come up to Him. And Jesus looks kind of almost like He’s fragile like if a child ran into Him a pinky would break and fall on the ground. Here you see Jesus running towards the children and the children running towards him, and there is one child who has been taken up into His arms. And to the left, you have the disciples in complete incomprehension. 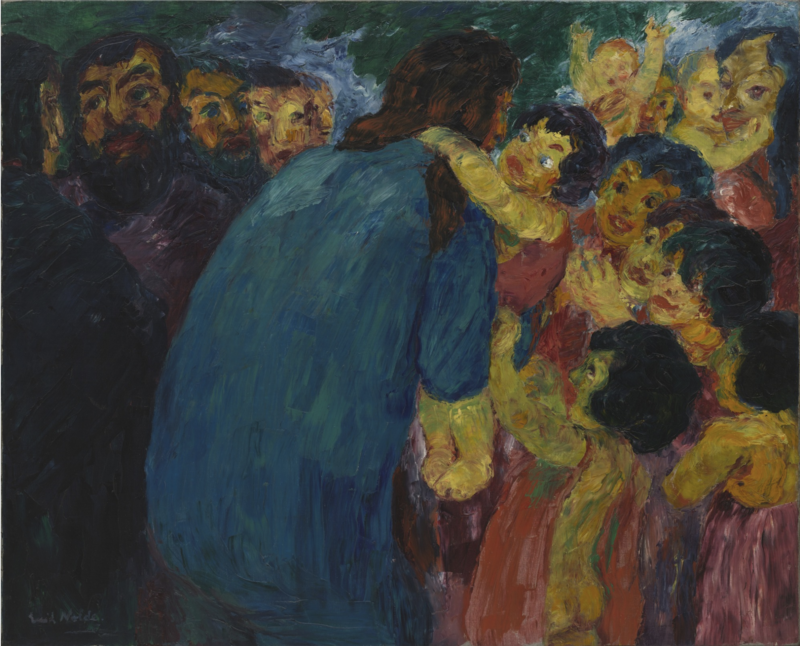 And so what Nolde wants us to see, is that we, in receiving that child go with the grain of Jesus’ love for the world. He doesn’t want us to see Jesus, he wants us to see the love of Jesus towards that child, so that we could live our lives as a kind of gesture of return. As a moment in which we reach out and hold on to somebody else. What are the gestures that you do? Have you ever had a moment in your life where there was a kind of pregnant gesture that said everything, that cost a little bit, but did something special? It was a gesture that he offered to my grandfather and gesture of gratitude of recognition of thanks. What do gestures look like in your life? What gestures have you given, what gestures have you received? What does it mean for this church to be built on gestures? Gestures of love and support and reaching out to one another, what does that mean? Last week our wonderful new associate rector gave an incredible sermon on stewardship, in which he talked a little bit about money and then he connected it to the Bible. And he said to me this week, that my job was to do the same. So I’ve talked a lot about the Bible, and I’ve talked a lot about Christ Church Cranbrook, and now I’m going to talk a little bit about money. I want to suggest to you that stewardship and pledging is a kind of gesture. We tell people that pledging is a spiritual activity. We tell them that because we don’t want you to simply engage in a calculation about what you owe. These are not dues that you’re paying. This is not an institution that you’re perpetuating. We want your pledging to be spiritual. We want it to be between you and God and your way of living in fidelity to the life that God has given you in this church. And often times we don’t say much about that, we just say it’s spiritual, but I want to suggest to you today that pledging is a kind of gesture. It’s a gesture of generosity that gives thanks to God, the generosity God has shown you. That’s your attempt to present yourself wholly to this body, which has so transformed so many people. It’s your willingness to be in community with us, and defined by our life together the grace of God, which is so transformative. May you find these gestures in your life. May you see the greater gesture of God’s love for you. And may that love flow through you and transform you, and enfold you and lift you up.